The Cretan Bluet Coenagrion intermedium is a damselfly endemic to (found only on) Crete. This immature female Cretan Bluet was photographed by Chris Durdin just inland of Plakias on Crete's south coast on 20 April 2017. From published and online information there is plainly a lack of records of this species; it seems to be under-recorded rather than rare. This photograph and information are made available online here to add to what can be found through internet searches. Cretan Bluet Coenagrion intermedium immature female, 20 April 2017. I saw this damselfly fly and perch on bramble and I managed three quick photos before it flew away. Not far away was a ditch with running water and the Kotsifos River is also close. 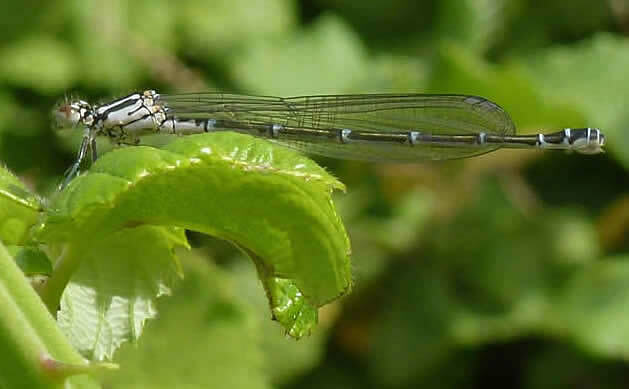 Cretan Bluet is closely related to Azure Damselfly Coenagrion puella, which is widespread in the UK and much of Europe. In the field it is effectively separated on distribution. There are no pictures of Coenagrion intermedium in Dijkstra (see references), just diagrams of the pronotum (a plate on the trailing edge of the thorax) and male appendages, both of which are slightly different from Coenagrion puella. For a 100 per cent positive identification this species would need either examining in the hand or close-up photographs from exactly the correct angle to see key features. The genus Coenagrion is easy to pinpoint because of the obvious 'Coenagrion spur' - the black line that extends half-way across the thorax (right). Dainty Bluet (Dainty Damselfly) Coenagrion scitulum is noted as on Crete; that species is smaller, shorter in the abdomen and favours still waters, absent at Plakias. Experts from the British Dragonfly Society have also ruled out this species. Cretan Bluet Coenagrion intermedium is said (in the Atlas) to prefer running water, such as streams, especially 'gallery forests' of Oriental plane Platanus orientalis. That description is some way off this area by Plakias, but the River Kotsifos flows through this area and has some shady stretches and Oriental plane trees. 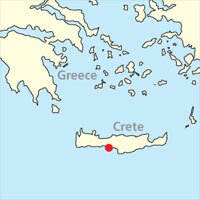 Map of Crete: the red dot shows Plakias. Field Guide to the Dragonflies of Britain and Europe by Klaas-Douwe B Dijkstra (author) & Richard Lewington (artist). Atlas of the European dragonflies and damselflies, editors Jean-Pierre Boudot & Vincent J Kalkman. Cretan Bluet on The IUCN list of threatened species. The books give 'mid-May to early August' (Dijkstra) or the middle third of May-July (Atlas) as the flight period for Cretan Bluet Coenagrion intermedium. However online sources (e.g. Wikipedia) say from late April. Much of the range is above sea level. This individual was near sea level on the south coast, which chimes with the early season timing. Crete Bird Reports. Collated by Stephanie Coghlan, made available on the internet through Honeyguide. Our Crete orchids page and orchids gallery. 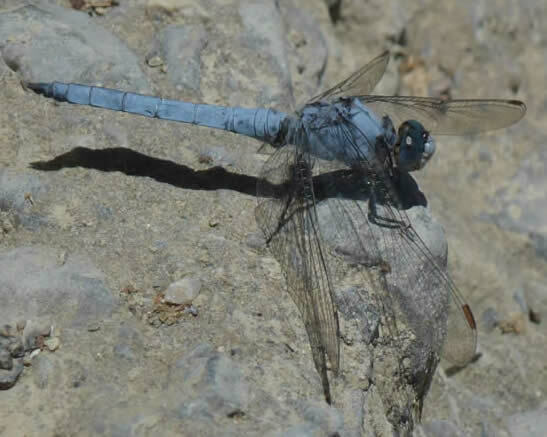 Our Crete holiday is normally in April and a little early for many dragonflies and damselflies. However in 2016 we were a little later and the season was well advanced: there is a small collection of odonata photos on Facebook here. Southern skimmer Orthetrum brunneum, 1 May 2016. Many more Crete holiday reports from two decades of Honeyguide holidays here. Photos on this web page by Chris Durdin.